Seafood often takes the spotlight in Taiwanese cuisine, since the coast is never far from any spot on the island. Taiwanese stir fried dishes are light and mild in flavor, which accentuates the freshness of ingredients like the shrimp used in this dish. Marinate the shrimp with 1/8 teaspoon of salt and 1 teaspoon of cooking wine for 10 minutes. Heat 2 tbsp. of oil in the pan over medium-high heat. Add shrimp and stir fry until 80% cooked. 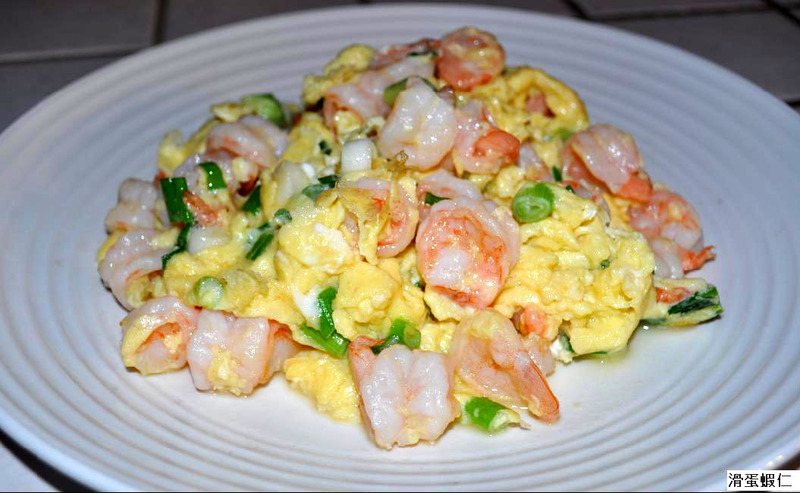 Remove and place shrimp in the mixture of beaten eggs. Add to the mixture the following: 1/4 teaspoon of salt, along with the starch-water mixture and green onions. Heat 2 tablespoons of oil over medium-high in the same pan and pour the mixture into pan. Gently stir fry the contents of the pan until the eggs are firm and soft. This dish is best served piping hot. I usually cut a line on the back of the shrimp with a knife and remove the black vein. The cut will help the shrimp more plump and flavorful as it cooks. How can I tell whether the shrimp and eggs have been cooked long enough? In preparing this recipe, it is better to undercook than to overcook, since an undercooked pan of eggs and shrimp can be heated again until ready. If the shrimp and eggs taste dry or tough, they may have been cooked for too long.